It’s good to see Michael Moorcock back in print in attractive accessible editions again. Thirty years ago the man ruled the paperback shelves with numerous titles in print, including half a dozen Elric novels, the Chronicles of Corum, the Jerry Cornelius books… and of course, Hawkmoon. Anyway, my point is, those fat hardcover editions are great for cranky old collectors like me. But they don’t do much to introduce the man whom Michael Chabon called “The greatest writer of post-Tolkien British fantasy” to a new generation. Michael Moorcock deserves to be celebrated with permanent editions of his work, sure. But he should also be available in cheap paperbacks that teenagers can fold in half while they’re reading, mesmerized, on the back of the bus. The era of the cheap paperback is over. But Tor did the next best thing two years ago, releasing all four Hawkmoon novels — The Jewel in the Skull, The Mad God’s Amulet, The Sword of the Dawn, and The Runestaff — in slender trade paperbacks with gorgeous new covers by Vance Kovacs. Now that all four have been remaindered (selling at Amazon for between $5.60 and $6.00 each, while supplies last), I took the opportunity to buy a complete set. Dorian Hawkmoon, the last Duke of Koln, swore to destroy the Dark Empire of Granbretan. But after his defeat and capture at the hands of the vast forces of the Empire. Hawkmoon becomes a puppet co-opted by his arch nemesis to infiltrate the last stronghold of rebellion against Granbretan, the small but powerful city of Kamarang. He’s been implanted with a black jewel, through whose power the Dark Empire can control his every decision. But in the city of Kamarang, Hawkmoon discovers the power inside him to overcome any control, and his vengeance against the Dark Empire is filled with an unrelenting fury. The Hawkmoon novels were originally written between 1967 and 1969; the Tor reprints were published between January and December of 2010. Roughly 200 – 220 pages each, their original cover price was $14 – $15; they are currently much less. Move quickly if you want copies; they are selling fast. I loved those books, John, and am glad you are reminding folks of them. I have to admit I thoroughly enjoyed the Hawkmoon books and still have a soft spot for them now (and I loved Huilliam d’Averc; probably the first time I came across the “ennui-ridden rake who becomes a tragic hero” motif). These are the sort of things that publishers should be releasing as cheap ebooks, so’s people with a fond remembrance can revisit them readily, and new readers can discover them cheaply. I agree. Tor has released them as e-books — but at $9.99 a copy, they’re not cheap. That’s more expensive than much-larger paperbacks. Not sure I get that, but that’s showbiz. This. I already have the DAW paperbacks and the White Wolf omnibus, but I’d gladly pick up the electronic versions if they were $4 or $5 each. I want to give Moorcock & Tor my money, and to have Eternal Champion books on my Kindle, but I just can’t justify paying $40 for the equivalent of maybe 700-800 pages. My DAW’s are pretty beat up but my White Wolf’s look beautiful (I’m skimming thru Count Brass right now). I can’t imagine purchasing any new editions, but I am glad the Eternal Champion cycle remains in print. I have no idea how many times my friends and I read, passed around and reread the original Elric and Hawkmoon books. They are such a fundamental piece of my love for fantasy fiction. Only Tolkien is important to my early years reading the genre. Also hoping the Corum books come back in print at some point. Depending on the day you ask, those might be my favorites. > Eternal Champion books on my Kindle, but I just can’t justify paying $40 for the equivalent of maybe 700-800 pages. > Hawkmoon books. They are such a fundamental piece of my love for fantasy fiction. You’re not alone. My experience was very similar — although we were also passing around Zelazny, Stephen R. Donaldson, Glen Cook, and David Gemmell. > Also hoping the Corum books come back in print at some point. Depending on the day you ask, those might be my favorites. Now that you mention it, I’m surprised they haven’t been reprinted more recently. The White Wolf omnibus edition is the most recent, selling for around $15 in hardcover on Amazon. The lowest price I could find for the 1980 Berkely paperback of the SWORDS TRILOGY was $148, though (!). I discovered Corum before Elric and loved him. I have all 6 books in the Berkely pb editions of the early 70s: the 3 books in the Swords trilogy (Knight, Queen, and King), and the next three beginning with The Bull and the Spear. Man, I loved those books! Thanks for sharing that. I had to run back to my paperback stacks to see if I had a copy of the second trilogy… I might be missing one or two. Time to track them down! It also looks like Gollancz over in the UK has been putting out omnibus paperback editions in recent years. I must be crazy, because the first Hawkmoon book (The Jewel in the Skull) did very little for me when I read it about six months back. . .I remember finding the first forty pages or so colorful and enthralling, but I thought it slipped quickly into summary when the title character actually entered the scene. Perhaps I should give Moorcock another shot with a different series? Thanks! Another book to track down. The collector in me is thrilled. > It also looks like Gollancz over in the UK has been putting out omnibus paperback editions in recent years. Yes — and there was a CORUM RPG a while back as well. The first Moorcock book I ever tried to read was AN ALIEN HEAT (at the age of 13), and I really didn’t like it. A bunch of people at a picnic talking for ages, as I recall. That’s as far as I got before I gave up, anyway. 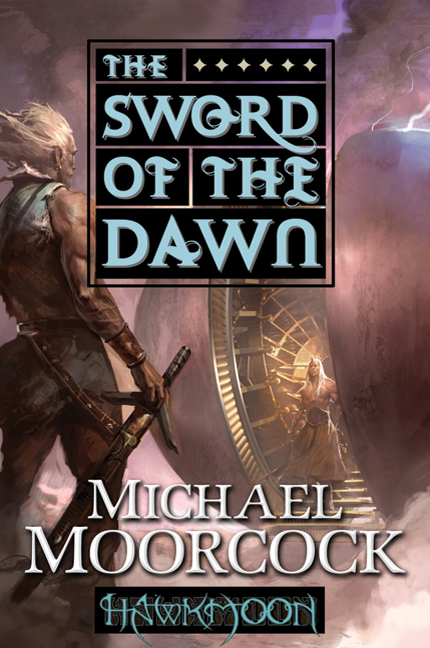 If I didn’t have a group of friends who loved the Elric books, I might never have tried Moorcock again. Yes, that’s a cool cover! The versions I linked to are the ones I bought (and that are still sitting on my shelf) — I think some of the first books I ever paid my own money for, so nostalgia. And to bring things back to Hawkmoon, I have all four in the DAW editions (from when I discovered that the bookstore in Austin, MN would actually special order books, and they had this set of gigantic tomes called Bowker’s Books in Print…) but it to this day bothers me somewhat that three of them have the yellow spines but Mad God’s Amulet was a blue-spined later printing. Ah, well. > to this day bothers me somewhat that three of them have the yellow spines but Mad God’s Amulet was a blue-spined later printing. Aaargh. I know exactly what you mean. It bugged me the same way when Robin Hobb’s first trilogy went to hardcover for the third book… now the last volume doesn’t match the others on my shelves! I’m the same way my wife is with furniture, except on a mall smaller scale. I want everything to match. Book collecting. It brings out the OCD in all of us, in multiple ways.